Almost eight years to the day, I posted this about using Nutter Butter cookies to make fun and easy Halloween Cookies. 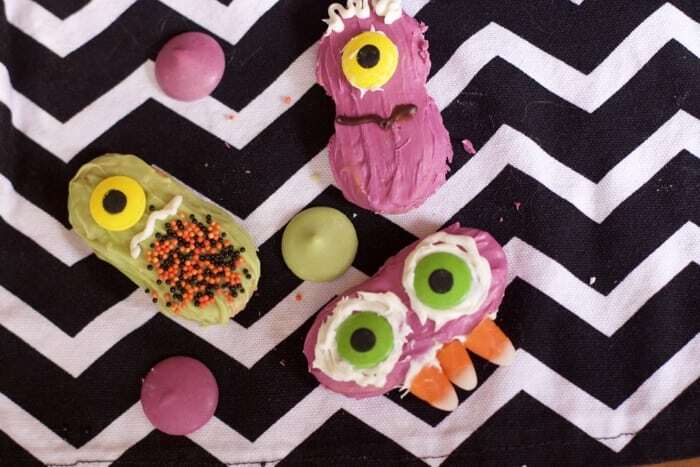 Feeling inspired to recreate these Halloween cookies we came up with some more fun designs as well. 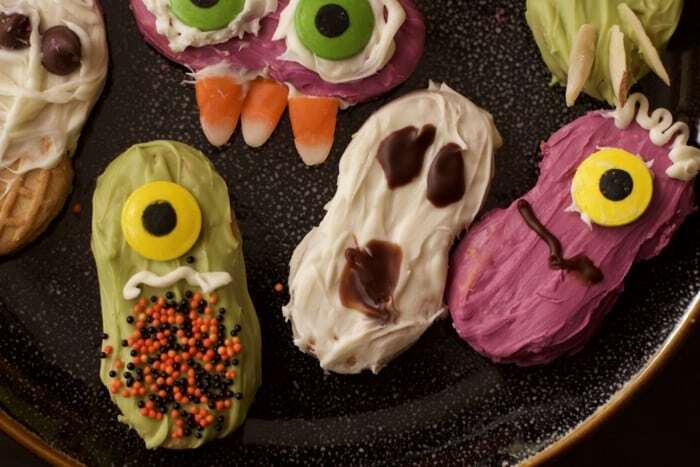 Halloween treats don’t have to be 100% homemade and these might even be too cute to eat. 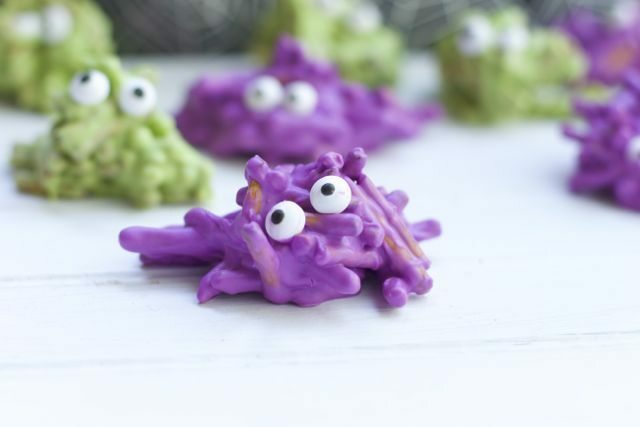 Serve them up with my pretzel monster Halloween Treats for the ultimate party food. 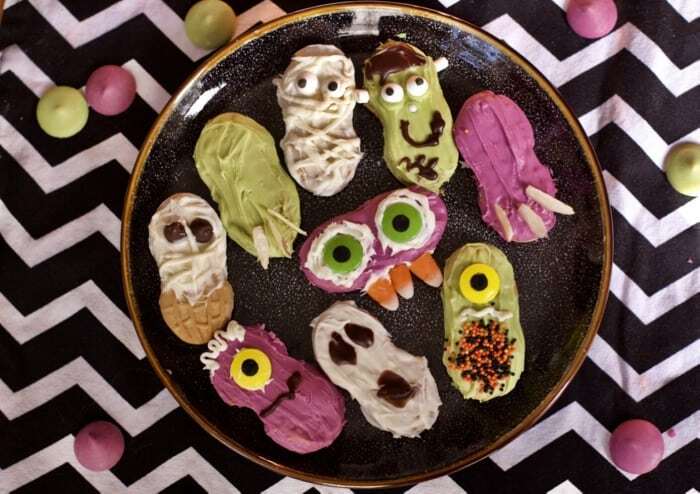 Check out these 6 Fun and Easy Halloween Cookie Designs Using Nutter Butter Cookies. After seeing the Spooky Claws in this month’s Family Fun Magazine I wanted to give them a try. We never buy Nutter Butters so this was a fun excuse to have them in the house. 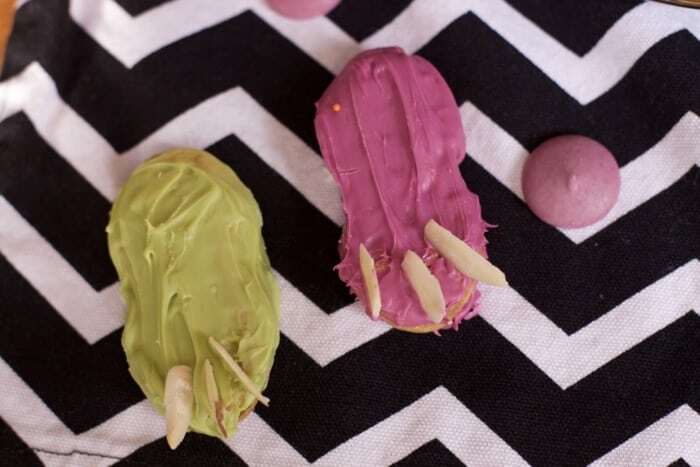 This is a great treat for a party, as long as peanuts are not a problem. If you are like me, you have several different colors of Chocolate Wafers. You can make these designs as easy or as complicated as you wish. I simply used items I already had at home to come up with these Halloween Designs. We started by dipping the entire cookie but it was getting a little messy. The majority of the cookies were just dipped to cover the top and sides. Before they can dry add cashew pieces for the claws. I did not have whole cashews but had some cashew pieces in my freezer so I just had to sift through them to find the right looking ones. This time I used sliced almonds and thought the result was perfect. I also thought Nutter butter cookies were perfect for ghosts too. I just dipped the cookies into melted white chocolate and added some eyes with cookie icers. I also tried some with chocolate chips to see how they turn out. Think they work but love the other ones. Next, my daughter suggested we make tombstones. Made some with white but had some black food paste so I added it to the melted chocolate and came out with the grey tombstones. Last time I had some leftover eyes from the Scaredy Cat Brownies so I made an alien. These would have been cute in the green if I had any left over. Talk about Aliens, we took it to a new level this time around. I think they are so fun and can be used for other kid parties as well. I used cookie icing for the facial decorations and added mini marshmallows for the side nodules. I thought these came out super cute. Simply dip the cookies in white chocolate melts like you would the ghosts. 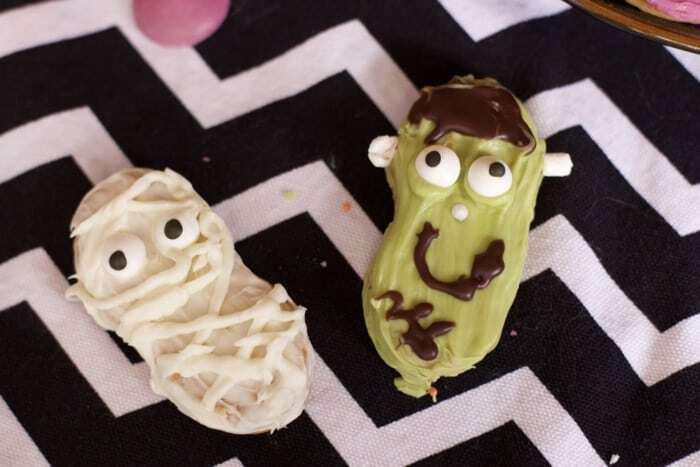 Add candy eyes and using a pastry bag create the mummy accents ontop of the chocolate. You can make as little or as many stripes. Push a lollipop stick into the cookies before the chocolate melts and make them into an edible centerpiece!! Did not think of that until I started writing this post. A platter of them will be just as pleasing to your goblins this Halloween. Who would have thought so many cookies could have come out of just one store-bought cookie. Have fun with it, let the kids get creative too.